Acrylics Anonymous, Issue #040 -- Atmosphere. Mood. Distance. Deep stuff in here folks. This month we’ve been back in the studio - filming and creating a simple tip for you on creating distance in your paintings, underwater and on land too. 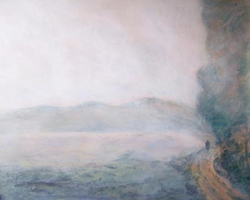 Create some atmospheric perspective today! Reduce your palette right down. I mean, RIGHT down. Three colours, max. Make the colour of the pervading light influence everything, and blend everything softly. Click here to have a squiz. For a re-cap on perspective in painting, including atmospheric perspective, have a read back over this page, at your leisure. 10,000 Subscribers Can’t Be Wrong. Can They?? To celebrate our milestone of 10k Youtube subscribers on the ExploreAcrylics channel, we created another tip which we think you’ll enjoy! Free downloads, yippee! I’m especially gleeful when they have useful info, and aren’t just cats doing funny things. Get yourself 5 free tips on creating atmospheric perspective in your work, from amazing artist Anthony Waichulis and artistsnetwork.com. More on creating atmosphere - of a different kind. Click here for 6 tips on creating the right mood at your show. 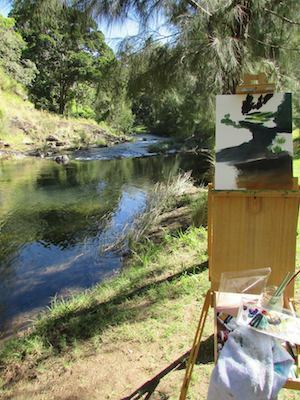 “Having been primarily a studio painter for over 25 years now, I have always admired those landscape painters who get out in the environment to paint. Its been a "romantic dream " of mine for a while now although the logistics of time, place, sunburn, cold, pesky bugs and the possibility of coming across a snake have always made me put it on the backburner! Driving the border ranges on Lions road is not for the fainthearted but it was there that I chose for my little getaway. 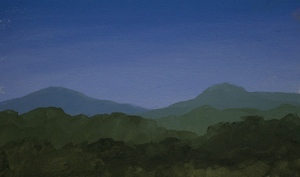 The spectacular mountain scenery was tempting, but it was Running Creek that stole my heart and begged me to paint it. Perhaps it was the fact that this road crosses the creek some 20 or so times on narrow one lane wooden bridges that influenced me! 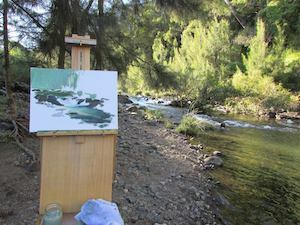 I arrived and set up camp beside the creek ......and I was excited to be there but realised I had put pressure on myself to produce something on canvas. I spent the afternoon looking about, taking photos, watching the play of light changing on the rock faces, and watching the water flowing in the creek. I did a little drawing to settle the nerves and began to relax. I decided to wait till the morning and have a fresh start. I realised my own need to be relaxed before I could paint! 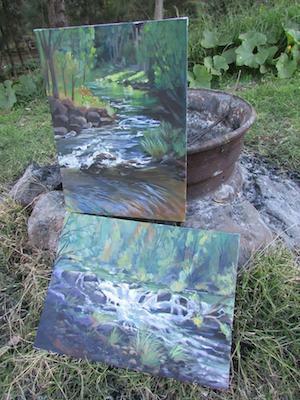 The sounds of playful creek gurgles soothed me to sleep and I woke enthused to paint. The sun crept down the steep mountainside quickly, and by 8am my easel was up and I was eager ........there was nobody around thankfully. If I was going to make a mess I didn’t need anyone to see it! ALL those creative doubts and thoughts tried to creep into my head and I consciously pushed them down. There was no place for them to take hold! I chose to work in acrylics this time as I am not set up yet to travel with wet oil paintings. 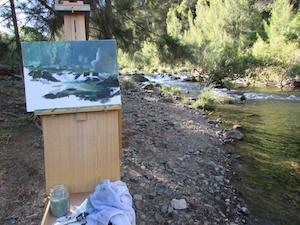 Plein air work is so different to working in the studio. There is the weather.....time of day .....movement of the sun and changing light to deal with. There is an urgency in the work ......to try and capture a moment in time before the whole scene before you changes. I realised I would have no more than 2 hours to get it down on canvas. 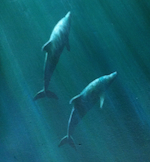 I did two paintings that day, and although they are not "finished" to studio standard, that was never the intention. The challenge of working quickly and under time pressure has paid off and I am very happy with myself and my 2 little paintings. In fact, I left with the biggest smile on my face....not only did I plein air but I did it alone! Get out there! It's fun! Thanks once again to Maria for sharing her exciting solo adventure with these wonderful plain air paintings!